Learning Lovely Letters at First Thursday on Main! 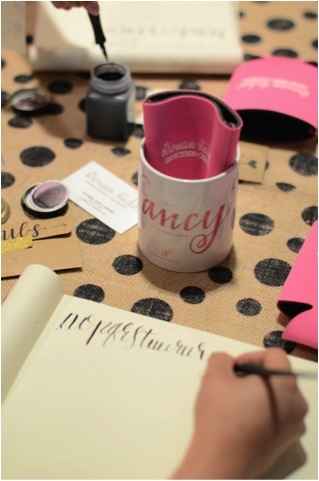 When I heard about the opportunity to take a calligraphy class with Stefanie Stroman, I was ecstatic. I remember back in elementary school when my friends and I would compete to see who could write their name the prettiest. 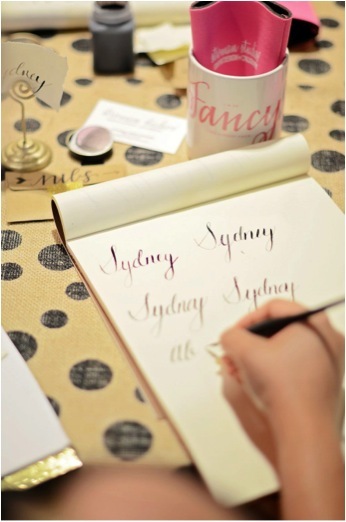 Flash forward to today and calligraphy is everywhere from envelopes to business logos! I’ve always wanted to learn the art of calligraphy, so I was excited that there is now a chance to learn here in Columbia. 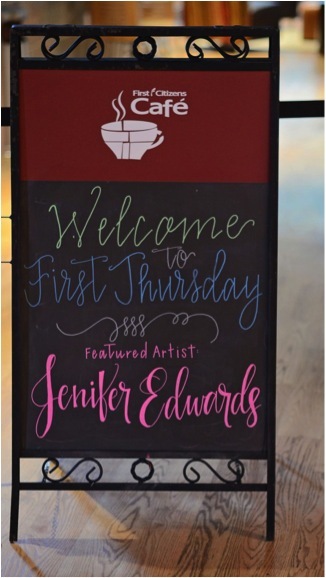 The class took place at First Citizen’s Café during their monthly First Thursday event. Our class was small, which was great because it allowed us to all chat and help each other. It also allowed our instructor, Stefanie, to walk around and give each of us individual instruction. She was extremely helpful in teaching us technique and answering all of our questions. I have to talk about her decorations, because the details were fabulous! There was lots of gold and glitter, which was consistent throughout the entire class. We also had some patriotic themed cupcakes for an early 4th of July celebration! She equipped us with everything we needed to get started- a practice notepad, as well as calligraphy writing supplies (pen staff, nibs, and ink). I loved that even though we were learning modern calligraphy, we were still using the traditional technique of dipping the pens into the ink. She also gave us an easy to follow instruction booklet that took us through the entire alphabet! The class was two hours long and was so relaxing. I was amazed to find how meditative the art of calligraphy actually is! And, to my surprise, I wasn’t terrible at it! Stefanie also supplied us with some recommended reading and resources to further research advanced calligraphy. I can’t wait to learn more about it! I highly recommend taking this class. It would be a great activity for a Girls’ Night Out or even if you’re just looking to try something new! 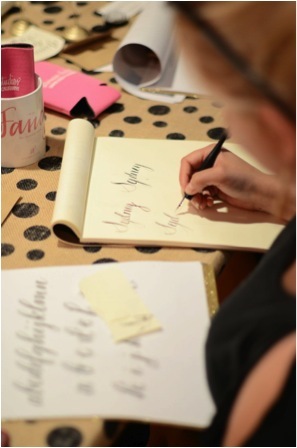 Interested in taking Calligraphy 101? The next class is August 7th at First Citizens Café! 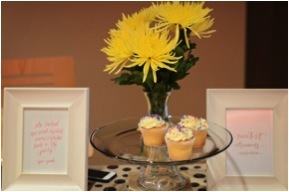 You can visit the Stroman Studios Etsy Shop for more information and to sign up for your class!